A growing demand for smoked meats has spurred a slew of new pitmasters to share their delicious takes on classic favorites with the Los Angeles area. Sure, LA might not share the same cultural pallet that California's southern cities do but that hasn't stopped this trend from blowing up right here in the city. If you're in the mood for anything from brisket to a rack of ribs, and happen to live in the Eighth & Grand luxury apartments, then here are the top 6 places to make into your new dinner destinations. This Kickstarter funded restaurant opened its doors in 2014, offering everyone's beloved barbecue favorites. Here, you can find baby back ribs glazed in sauce, delectable smoked wings, slices of tri-tip, and more classics to drive your taste buds wild. What really sets them apart from the rest are the side dishes they offer, which pair perfectly with nearly any of their meals. Paprika dusted potato salad and picked cucumber salad are two recommendations but if out of the ordinary isn't what you're looking for you could always go with good ol' cornbread muffins. Patrons can complete their meal with a wide variety of craft beers on draft at the bar. Snagging a seat here might be difficult, given the smaller size of the building, making takeout an excellent option on busy nights. If you aren't sure exactly what it is you want to eat but know that only barbecue will fill the pit in your stomach, then head over to J "n" J's (yes, that's how it's punctuated) where you can pick from a little bit of everything. From various cuts of pork to chicken and beef served practically any way you can imagine, the options are endless. This is also a great choice if you are in the mood for barbecue but the rest of the people in your group are not, since they serve things like burgers and Philly cheese steaks as well. As for taste, this menu comes with strong Louisiana smokehouse flavors. If that doesn't mean much to you, then think oak, hickory, and pecan wood glazes as well as rubs then pair them with collared greens. While the brisket is tasty, your taste buds will thank you later for getting their beef ribs or chicken. Found in Grand Central Market on Hill Street, this eatery brings a taste of Texas to the city. With a focus on brisket made the way The Lone Star state likes it, you can expect lean, peppery, oak smoked meat topped with onions and pickles. All of which is paired with white bread and top of the line craft beer. Other menu items worth a try are their creamy coleslaw, extra cheesy mac 'n' cheese, and a jambalaya packed full of flavor. Plus, they serve brisket breakfast tacos on the weekend. If you have yet to give this place a try, you are in for a real treat. If you're city savvy, then you already knew this was going to be on any food list in the LA area. 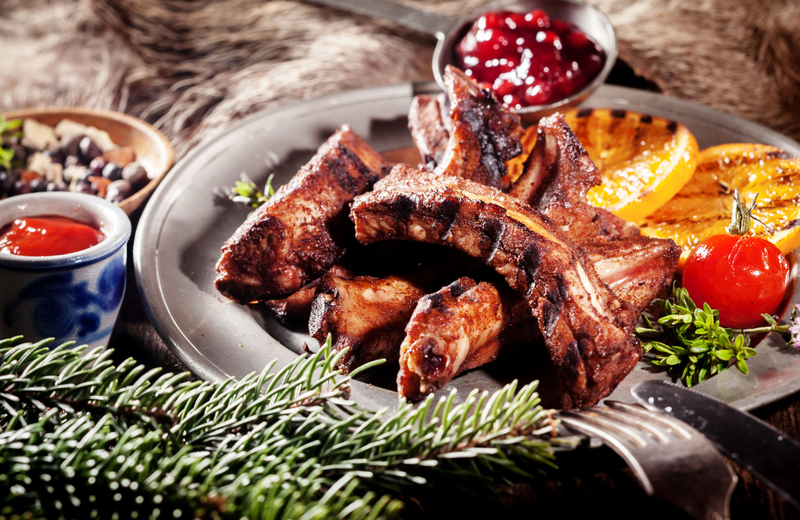 Phillips has been serving up their renowned pork ribs for over 20 years, and they're hard to beat. While the wait for your food might be long, every second will have been worth it to enjoy these surprisingly lean cuts slathered in a sauce of your choosing. They also serve your traditional beef ribs, but that isn't what has created their hordes of loyal fans. If you aren't sure what sauce to go, because picking one can be tough, try the hot barbecue. It offers a mix of spicy and tangy that really compliments the flavor of the pork. Looking for a catering van that pumps out mesquite smoked meats? Robert Earl's does just that out of the back of an old ice cream truck. With meat tender enough to literally (yes, literally) fall off of the bone, it's no wonder Mr. Earl's BBQ truck made this list. Homemade and cooked to perfection, his pork and beef delicacies are paired with his wife's vegetarian sides. Don't let the veggie label steer you away, though. It's impossible to tell that her greens don't have bacon coursing through their leafy veins. This is another Texas style flavor house, but with one twist aside from the veggie pairings. Here you can get a piece of pan fried cornbread topped with banana pudding. It's the perfect end to a perfect meal. In the mood for a smoked turkey sandwich stacked high, hot links piled on top of collared greens, or a pulled pork stuffed bread roll? How about a whole pound of juicy, tangy, sauce slathered meat? Well, that's what Bigmista's is known for. Originally a food truck concept, this barbecue and sandwich shop now stands a brick and mortar building with lines hanging out the door on weekends. With a long wait, it might be hard to get in before their gigantic meat platters sell out. That being said, heading here early will be worth the reward. All of these fantastic barbecue joints, and several others who simply could not fit on our list, surround the homes at downtown LA's most desirable address. The Eighth & Grand offer a distinctive luxe living experience carefully designed to appeal to discerning tastes. Chock full of amenities to accommodate a variety of lifestyles, every consideration has been taken into account to deliver residents a home that's hard to leave. You can relax in the zen garden, see a movie in the built in theater, relax on the sundeck complete with rooftop pool, and so much more. Pet friendly, health conscious, and Greenpoint-rated for its eco-friendly features, these lavish homes are as progressive as they are cozy. We invite to stay in one of America's most cultural and thriving cities, right here at the Eighth & Grand.